Will Scott Pruitt's allies in Congress turn against him? 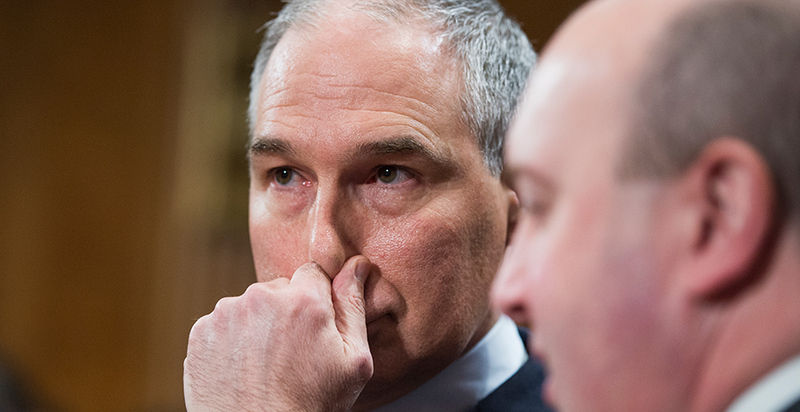 Will the embattled EPA chief apologize? Will President Trump tweet about the performance? These are some of the themes to look for as Pruitt heads to the House today for back-to-back hearings that are certain to turn into a media spectacle. This will be Pruitt's first congressional appearance since headlines about mounting scandals and ethical missteps have piled up in recent weeks. Pruitt will start the day in a House Energy and Commerce subcommittee hearing before heading to a House Appropriations subcommittee in the afternoon. The doubleheader gives House members the chance to publicly grill Pruitt about spending on his travel, security and $50-per-day condo deal, among other concerns. It'll also give Pruitt the chance to publicly make his case for keeping his job as critics — including some Republicans in Congress — call for his ouster. Do Republicans have his back? Some Republicans have openly slammed Pruitt for his spending at the agency, but it'll be notable if GOP lawmakers broadly pile on the criticism about the ethics allegations. Fiscally conservative Republicans who support Pruitt's policy agenda may join their Democratic colleagues in chiding Pruitt for his use of taxpayer cash. Rep. John Shimkus (R-Ill.), chairman of the Energy and Commerce subcommittee hosting Pruitt this morning, signaled that Republicans on the committee won't stick just to policy — discussions Pruitt would likely prefer to ethics issues. Pruitt's prepared remarks deal entirely with policy and budget talking points, skirting ethics and spending allegations entirely (Greenwire, April 25). "I think you'll hear people ask him about policy and stewardship of his office," Shimkus told E&E News yesterday. He declined to say whether he thinks Pruitt ought to be fired. The Illinois Republican said he hadn't been asked by the White House to temper criticism of Pruitt. Bloomberg reported earlier this week that White House officials cautioned GOP lawmakers against defending the EPA boss. "It's my subcommittee. They haven't talked to me," Shimkus said. Rep. Greg Walden (R-Ore.), chairman of the Energy and Commerce Committee, declined to detail his line of questioning for the administrator. "We'll have an opportunity to address the issues that have been raised and talk about policy," he said. "He serves at the pleasure of the president." Pruitt still has some stalwart supporters in the House GOP ranks, including House Science, Space and Technology Chairman Lamar Smith (R-Texas). Smith visited EPA headquarters earlier this week when Pruitt rolled out plans to reform science at the agency — one of Smith's longtime legislative goals. Asked whether he's worried about Pruitt's future, Smith said, "No, he's doing a great job, I think." Smith's committee won't be among those grilling the EPA boss today, but the Texas Republican expects Pruitt to have "good answers" for ethics questions raised by his colleagues. "They're just that, they're allegations, and I think we need to hear what he has to say, and I think there will be good explanations." To date, Pruitt has deflected criticism of his first-class flights onto his security team and blamed his staff for the hefty bonuses approved (and later revoked) for two favored aides who came with him from Oklahoma. The New York Times reported yesterday that the administrator is likely to continue to avoid personal responsibility today. A prep sheet obtained by the newspaper revealed that Pruitt plans to say career and political staff were responsible for the raises to staffers and his security team required him to fly first and business class. If he does, Pruitt will be repeating the same approach he used in an April 4 interview with Fox News' Ed Henry, largely seen as damaging to Pruitt. In that interview, Pruitt stated he was unaware of the raises at the time they were approved. "I found out this yesterday, and I corrected the action, and we are in the process of finding out how it took place and correcting it," Pruitt told Henry. Pruitt's chief of staff, Ryan Jackson, later took responsibility for the substantial raises and backed up the administrator's statement (Greenwire, April 10). In addition to questions from Congress, Pruitt is facing a series of investigations into misuse of funds and power from EPA's inspector general's office and the Government Accountability Office. The White House is also looking into Pruitt's actions, although officials have declined to provide details (Climatewire, April 25). Pruitt observers are keeping a close eye on the president's Twitter feed to see how Trump responds to his EPA administrator's performance today. The last time Trump tweeted about Pruitt was on April 7, just a few days after the administrator's Fox News interview. At that point, he defended Pruitt's actions. "While Security spending was somewhat more than his predecessor, Scott Pruitt has received death threats because of his bold actions at EPA. Record clean Air & Water while saving USA Billions of Dollars. Rent was above market rate, travel expenses OK. Scott is doing a great job!" The president has remained largely silent on the administrator since then, although White House staffers believe Pruitt will soon be fired, according to a White House official (E&E News PM, April 24). Democrats and environmental groups are turning up the pressure on the administrator in the lead-up to the hearing. Yesterday, EPA union members joined members of Congress and environmental and public health groups outside EPA's Washington, D.C., headquarters to call for the president to fire Pruitt. Rep. Don Beyer (D-Va.) was among those rallying outside the agency. "In my perfect world, the president would fire [Pruitt]," he told E&E News. "But I don't expect that necessarily moves us in the right direction on the environment because the [Deputy] Administrator [Andrew] Wheeler moves right in, a coal lobbyist. For that reason, for me as an environmentalist, I don't think the regulatory environment is going to suddenly improve with Scott Pruitt gone," he added. Does climate change come up? Pruitt and his allies would prefer to steer the conversation toward policy, meaning his work to roll back climate regulations could get some attention today. Today's hearings coincide with the final day to comment on a proposed repeal of the Clean Power Plan, an Obama-era rule aimed at controlling greenhouse gas emissions from power plants. Many of the more than 19,000 public comments are highly critical of the agency's plan to ax the rule. Pruitt's own prepared remarks for the Energy and Commerce subcommittee hearing make no mention of the Clean Power Plan repeal or replacement actions. They do, however, discuss funding for the popular Energy Star program, which certifies the energy efficiency of various products. EPA is asking Congress for the authority to fund Energy Star through fees, a year after it faced fierce backlash for zeroing out funding for the program. He also plans to highlight efforts to fund "core work" in air and water quality, as well as initiatives to remove lead from drinking water and to clean up Superfund sites. Some Democrats want Pruitt to be grilled on policy, too. "The things we really care about are not the phone booth or the first-class travel to New York or Boston, it's the dismantling of the environmental regulatory system put in place by Democrats and Republicans over the last 46 years," Beyer told E&E in a recent interview.